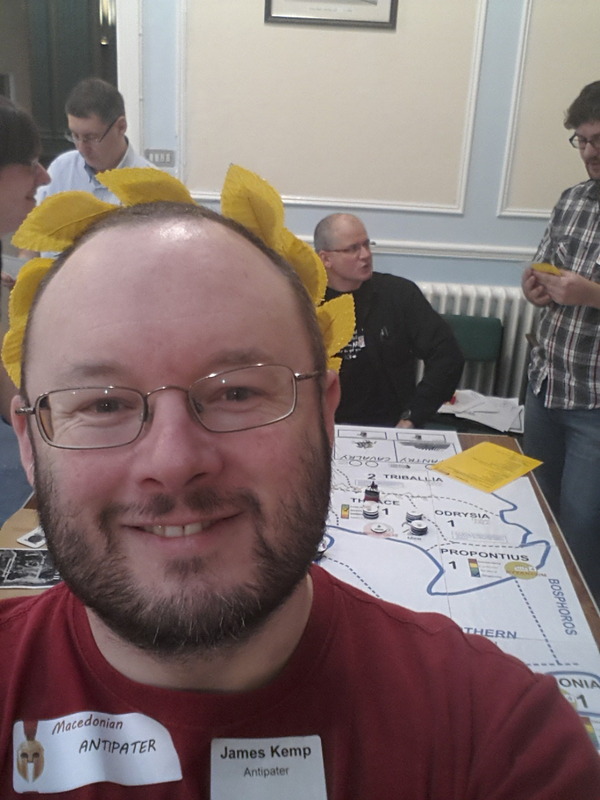 Rob and John are close to putting on a second version of their megagame Funeral Games but were dissatisfied with one part of the game, the conflict between and with the Greek City States during the fight between the rival Alexandrian generals, the Successors. The problem they had was that there were too many City States to merit a team or player each in Funeral Games. This would unbalance the game, but there were enough differences and rivalries that each City required an independent treatment. Their idea was that the Greek City State players would represent the political philosophies of the time and struggle between themselves for control of each City. So there were players representing Democracy, Oligarchy, Tyranny, and Cynics. Whilst each player was not meant to represent a real historic character, we were given historical personalities to emulate, for example there was Plato, Aristotle etc. I was given the role of the cynic Diogenes. The philosopher players could advance their cause in two ways. Playing influence chits onto city states to move the “dial” of political philosophy towards their preferred philosophy. Each player had a list of objectives. For example Diogenes wanted a Macedonian General or Royal to declare freedom for all Greeks. I did not see the other player’s objectives, though from talking to them during the game and watching what they did, they wanted a differing range of objectives leading to conflict. I enjoyed them game. My role as the cynic was effectively to criticise everybody and rail against this new fangled politics and hanker for the good old days of honest Greeks living in honour, to their means and being honest. I had very few influence chips and could only gain more chips if a City State entered into a brief unstable situation, moving between Democracy, Oligarchy or Tyranny. 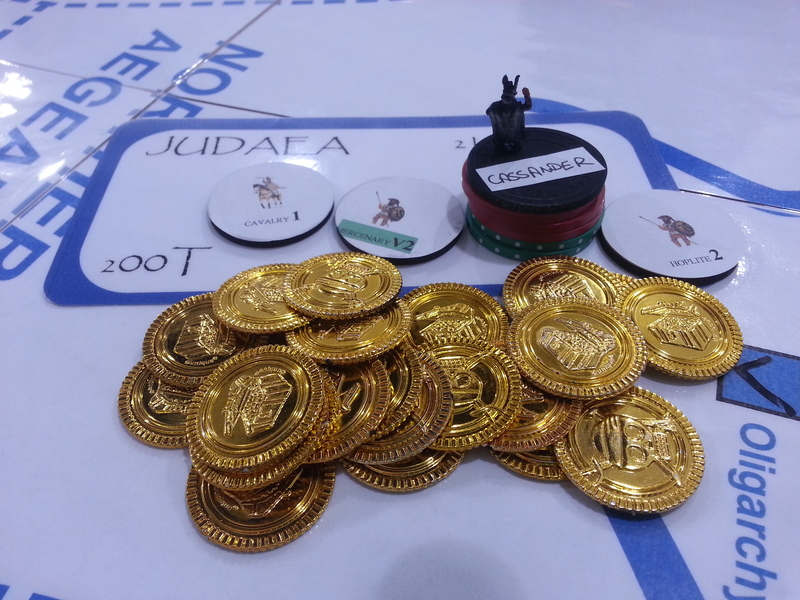 My “special ability” enabled me to place my influence chits at the end of the turn so that I could alter a City’s political status and avoid competing with the other stronger political players. However I could never control an army or navy etc. whilst the other players could use their influence to mobilise, march and fight armies and navies. I did raise the amount of chits I had to use from 3 to 7, though I was doing this at the expense of the more easy to poach Democrats who were nearest to my way of thinking. I was planning to use my new influence to attack the Oligarchic cities in later turns. There was a enough in this little mini-game to be of interest to the Greek players. If the Macedonians just ignored the Greek situation I think they would swiftly regret it as the players would probably cook up some power sharing compromise between them to get rid of the Macedonian influence. If the Macedonians were active in Greece then there would conflict, with the Tyranny player trying to assist the Macedonians at a price and the rest cooperating a little amongst themselves to prevent the Macedonians and their lap-dog Tyrants from dominating. The only criticism the players had was of the swinging nature of the polities. Could they really move so rapidly between Democracy and Oligarchy? Should the influence track be a circular track or a ladder? Alexander -The Great… Sayings !